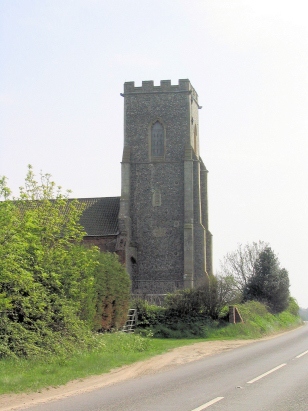 The parish of East Ruston lies in northeastern Norfolk not far from the North Sea coast but firmly within Broadland. 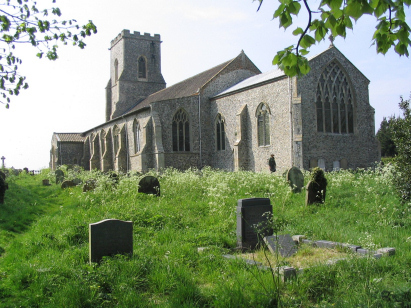 The parish sits on the eastern bank of one of Broadlands rivers the River Ant and is roughly 4 miles southeast of the market town of North Walsham. Settlement in the parish is dominated by the cluster grouped along a north-south running lane parallel to the course of the Ant. The parish is fairly low lying with much land in the flood plain of the river although drier land much used for arable agriculture rises in the east of the parish. The parish is barely 3 miles from the east coast and this coast is eroding rapidly due to the light glacial geology. St Mary's church is rather a distance from today's population cluster being sited adjacent to the B1159 which runs northwards from Stalham towards the coast and some miles and a half away from the village. The church appears to have been built on the cusp between Decorated and Perpendicular styles having a mixture of both in those windows which are original. The whole north side of the church was rebuilt in the late 18th century after an aisle was removed. As usual much was restored and refreshed in Victorian times. Two standard 800-entry registers cover the period of the transcript. The first runs until 1857 whilst the second runs until the late 20th century. The registers were deposited and filmed in two separate depositions, the first register is filmed on Microfiche 8 & 9 in the collection of the Norfolk Record Office, these fiche are rather elderly and suffer the quality issues of the period in which they were filmed often rather vaguely focussed and lacking clarity generally thus making for a tricky piece to transcribe. The second register is filmed on Microfilm MFRO694 in the collection of the Norfolk Record Office, although the register is classed as unfit for production the images are adequate to the task being filmed using more up to date techniques as a result this period as rather easier to transcribe. Overall the standard of images could best be described as adequate rather than good and it is not impossible that misreads may have occurred despite best efforts to avoid that possibility.